This week’s Danger Gal is Elizabeth Swann from the Pirates of the Caribbean trilogy. This article contains spoilers for At World’s End, the latest movie. Elizabeth: Try wearing a corset. Over the course of the three Pirates of the Caribbean (POTC) movies, Elizabeth Swann’s character leaves behind the world of her birth for a whole new one with its own set of rules. The world of her birth restricted women and men both in how the genders related to one another, but also restricted freedom by class. Both Elizabeth and Will recognize this innately, but Elizabeth embraces crossing the threshold into a new world while Will resists it. Physically, Will is closer to the pirate world by his birth as the son of a pirate, but Elizabeth is closer to this seemingly chaotic world in her heart and, while it’s a terrifying journey, she yearns for it and acts proactively to achieve being a part of it. 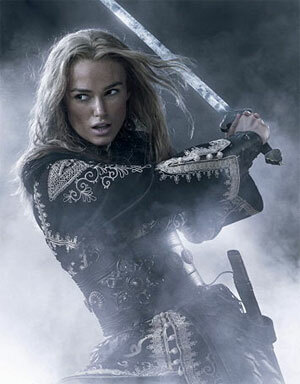 There has been some comparison of Elizabeth Swann to Princess Leia, but the primary difference between them is that at the end of the trilogy Swann learns to swordfight while Princess Leia never wields a lightsaber. Lance Mannion compares POTC to Pride & Prejudice and laments that Swann is simply a “boy with breasts” instead of a truly heroic character as Knightley portrayed Elizabeth Bennett. Elizabeth Bennett is indeed a superb character in a well-loved story, and while both stories deal with pushing the limits of proper behavior, there are two very important differences. One, genre. POTC is an action adventure story so loosely based on history and containing supernatural elements that I would label it historical fantasy. Pride & Prejudice on the other hand is a work of historical fiction meant to be a fairly accurate portrayal of its time. Two, POTC is fundamentally about totally breaking away from an established system in favor of a new way of living, instead of trying to make a current system work as Pride & Prejudice pursues. Swann’s character achieves far more in the POTC trilogy than any of the male characters. She rises from being the governor’s daughter to that of a pirate ship captain to the Pirate King. While at first I was disappointed that she turned out not to be Calypso, Seo Feng’s bestowal of the Empress captainship to her came not just out of necessity, but it occurs after he realizes she really is just a regular girl. He judges her based on her human abilities, not on some mythical feminine ideal. Moreover, the trilogy depicts other women with power in the pirate world, most notably Tia Dalma (before we know her as Calypso), Anamaria and Mistress Ching. Governor Swann: So, this is the path you’ve chosen? After all, he is a blacksmith. Young Elizabeth: [Will awakes, grabbing her wrist] It’s ok. My name’s Elizabeth Swann. Young Elizabeth: I’m watching over you, Will. And, there’s this: the question regarding Elizabeth in AWE is not “Who is Elizabeth going to be with?” It is “Who is Elizabeth going to be?” Perceiving her choices as nothing more than becoming either “Jack’s lover” or “Will’s lover” — well, that seems a bit diminishing, don’t you think? In light of that, I think it’s safe to assume that Elizabeth continues to manage her own destiny and write a new role for herself in the world. Click here for links to many of the comments on the WordPlayer Forum from POTC writers Ted Elliott and Terry Rossio. Click here to read Elizabeth Swann’s entry on Answers.com. Click here to watch the extra scene from AWE that rolled after the credits. Kaellana also makes some excellent points about AWE. Feminist SF Blog Carnival article “White and Black Sexuality in Pirates of the Caribbean: At WorldÃ¢â‚¬â„¢s End” by Lake Desire. Great post! Loved the movie and love her character. MOST excellent summary of a KILLER character and a fabulous trilogy.